But while the bacon panic wasn’t real, there is a crisis in our meat supply and it’s no joke. We produce a lot of meat, but we feed a lot of Americans, and more all the time, thanks to the simple laws of multiplication, along with the simple addition of immigration. There is a drought, so there is less grain and corn for the animals to eat. Most of the producers are marginally profitable at best, and Americans refuse to pay more for meat than they do for Froot Loops, despite the fact that no one has to raise and feed and kill and process Froot Loops. I’m not kidding about this: go to the supermarket and see how much a package of pork chops cost, or half a chicken, and then compare that price to a box of Froot Loops. All the things that consumers have, rightly, come to fear and distrust about the meat industry are a result of this problem. Hormones, to make the animals grow faster? Check. Antibiotics, to allow animals be cramped and crammed and stressed without dying of infections? Check. Farrowing crates and beak clipping, so as to squeeze more meat more efficiently out of factories? Check. Even the vile pink slime that everyone hates so much is simply a product, literally, of the beef industry’s need to get maximal yield out of each animal. We all love happy animals on small farms, but there’s no way to feed Americans living in or near poverty, as well as having tons of meat to export to China and elsewhere. 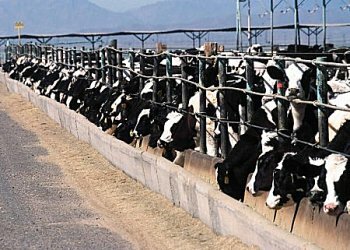 The result is that producers are bumping off animals as fast as they can and getting out of the business before feed costs get worse and they are forced out. That’s where the bacon shortage comes in. Less pigs, less pork, less pork bellies for yummy, smoky bacon. To Ozersky, this means a future of expensive, unhealthy meat and abused animals. I would argue we already have two of the three (yes, meat is cheap). He seems to lament the prospect. However, he doesn’t really have much to say on what to do about it. So I’ll help him out: when a product is getting more expensive, more unhealthy, more ethically execrable, and more environmentally costly (which Ozersky doesn’t really go into), then perhaps the public should stop consuming that product. I know. Radical idea. But Is it really that hard for Americans and the rest of humanity to imagine a future that isn’t fueled by cheap, factory-farmed meat? I don’t imagine it, I dream about it!